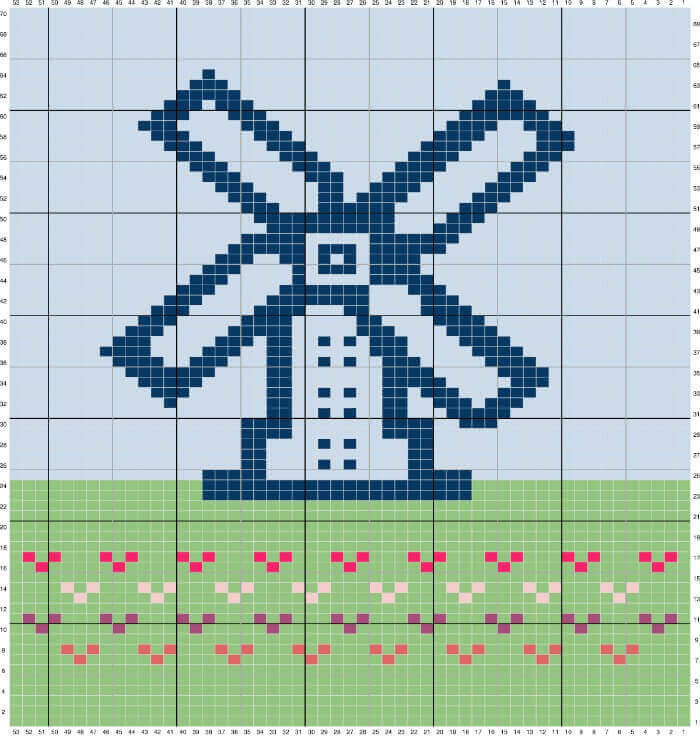 A Windmill Graph Pattern to Knit or Crochet! 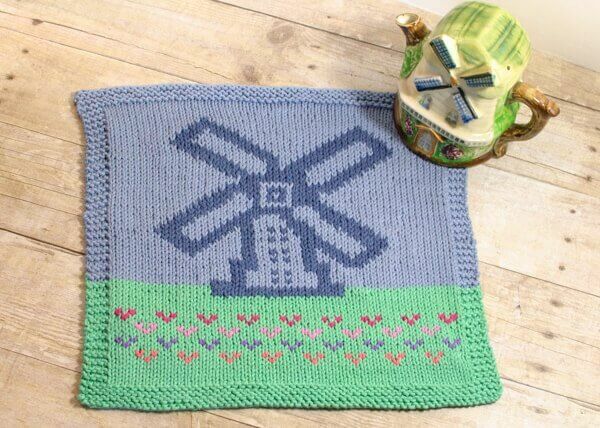 I designed this pretty windmill scene while reminiscing about my grandmother’s house filled with little windmill figurines, blue Delft pottery, and yummy spiced cookies. It can be used as a table mat, wall hanging, or even an afghan square. If you add some extra rows it would even make a great decorative hand towel! Best of all, the graph can easily be used for crochet, knit, and Tunisian crochet projects. I can’t wait to see all your pretty windmill projects! Finished pattern as written here measures approximately 13 in. × 13 in. (33 cm × 33 cm). Gauge = approximately 20 sts and 28 rows per 4 in. (10 cm). Carry colors loosely across the back of your work (the carried yarn is called a float) tacking longer floats as necessary. Follow chart rows from the bottom up. Odd rows are knit and followed from right to left (right side of your work). Even rows are purled and followed from left to right (wrong side). Work 6 rows of garter stitch (knit every row). Odd rows (RS): Knit 4, knit row of chart following from right to left, knit 4. Even rows (WS): Knit 4, purl row of chart following from left to right, knit 4. Continue working odd and even rows as written until chart is complete. Work 6 rows of garter stitch. Bind off and weave in ends. Block if desired.